In week one of the exercise students determine stream discharge by doing some tedious, but simple hand calculations using data sets provided by the instructor. The following week is designed to be more hands-on. Here, they collect their own field data and create a spreadsheet to perform the calculations more efficiently and accurately. 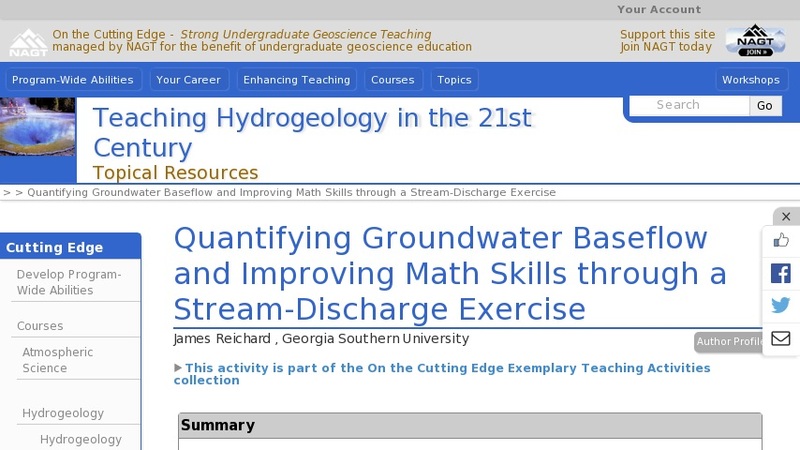 By collecting the data themselves, students gain a more thorough understanding of how stream discharge is both measured and computed; they also learn how the results can be used to determine groundwater baseflow. The fact they do hand calculations prior to creating the spreadsheet helps build their math skills and reduces the "black-box" effect that often develops when using software for data analysis. Students also gain valuable experience creating spreadsheets and learn how this tool can be used to perform repetitive computations more efficiently and with less error. Finally, this exercise asks students to consider the accuracy of their replicate field measurements through a series of questions related to their standard deviation and percent error calculations.